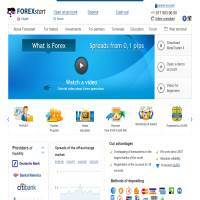 Forex Start is a long-running online Forex trading website. As well as providing MetaTrader 4 so you can trade on Forex markets, it also offers online resources to help to improve your trading decisions. You can follow other traders or learn top tips from the community forum or simply use a demo account to practice trading without financial risk. If you open a full account, it is important to remember that online trading can result in the loss of money, as well as potential gains. Follow other traders or learn top tips from the community forum. ForexStart.com uses the MetaTrader 4 platform, which provides a comprehensive set of tools to help monitor, analyse and predict market trends. Many Forex trading sites opt for MetaTrader 4, making it a solid choice for the particular needs of currency trading. You can easily view tables and graphs with all the necessary information, helping you to make wiser trading decisions. Record data in tables and graphs using the MetaTrader platform. The educational and community features on this site are worth a second look, with video tutorials, advice on professional systems, tips on graphical analysis and more. You can also chat to fellow traders, sharing ideas or concerns, asking questions and more. The forums include the latest trading news, and you can see how many members are online when you are. Unfortunately, the forum was pretty empty when we tried it, but perhaps you’ll be luckier. If you’re new to Forex trading, you may wish to explore ForexStart in detail, as it provides pages explaining what Forex is, with general tips for getting started. Their dictionary of terms might also come in useful, as you’ll likely come across a lot of technical trading language. If you’re still stuck, there’s an online consultant option. This site focuses on currency trades, so let’s look at that in a little more detail now. Forex Start allows you to decide your leverage rates (from 1:1 to 1:500) which might be very useful if you decide to alter leverage as you continue to trade. There are explanations on exactly what that means and how it might alter your profit or loss, with clear examples. Forex traders can take advantage of deposit bonuses and competitions, and the site seems proud of its international appeal, with clients from around the globe. You can trade on the Forex market using iPhone, Android, Web terminals and more. Forex Start, as its name implies, may appeal to new traders who are just starting out with currency pairs trading. You can adjust leverage to suit your needs, and there are no commission charges. There are also plenty of resources to help you learn about Forex trading. Whilst the site offers community features, these don’t seem to be hugely popular, and the site could use a bit more information about the pairs it offers and some of the very basic aspects of online trading. Those things considered, it’s certainly worth taking a look around and trying out a demo account to see how you get on.